These technologies can be used for cooling and dehumidification applications and have the potential to reduce energy requirements for this service by 92-95% (Philibert, 2005). In humid areas liquid dessicants would be preferred. 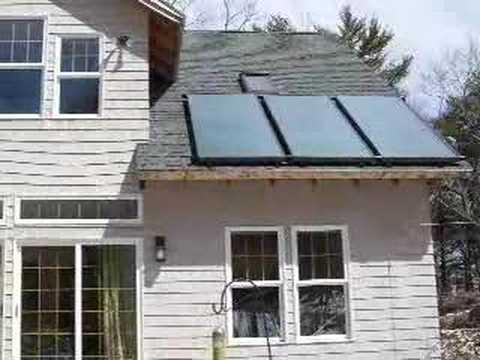 Solar Water Heaters (SWH) can also be applied for cooking. The use of an insulated box and collector for solar energy suffers from the apparent movement of the sun and the higher temperatures required through additional solar concentration. Recent developments, however, have explored the use of non-imaging optics to concentrate the sun’s energy and to compensate for the sun’s apparent movement (Pereira and de Almeida, 2006). An overview of examples of SWH projects applied in industrialised countries can be found on the IEA Solar Heating and Cooling Internet site. In particular, Spain is supporting a new major project called ‘Bioclimatic architecture and Solar Cooling’ with the aim of reducing the energy demand up to 80% in five new office buildings using passive and active solar technologies. It involves building companies, manufacturers, installers and university researchers. While industrial applications of the technology are low at the moment, the potential is great as the industrial demand for heating is mainly below 250ºC. In particular, the low temperature range in industrial heating demand (less than 80ºC) is well within the range already available for commercial solar thermal collectors (Weiss and Rommel, 2005). The heat can, for instance, be used in industrial processes such as crop drying and in desalination plants. Water quality (water must be non-corrosive to copper nor have a high mineral content). In addition, where an active or pumped system is used for circulating the fluids, a Solar PV panel can be fitted which activates when there is enough solar energy to heat the water in the collector. Passive systems use either an additional storage tank above the collector, or an Integrated Collector and Storage system where the evacuated tubes are used as combined collectors and storage areas for the hot water. The solar combi systems mentioned above consist of a large tank combined with a heat exchanger for space as well as water heating. New systems are being developed for thermal storage as well as in combination with other technologies such as heat pumps and biomass pellet boilers. Large central systems for district heating are also being developed where the heated water is stored during the summer and available for heating in winter (Mangold and Schmidt, 2006). Where solar insolation levels are high (i.e. when a large amount of solar radiation is incident on the surface of the earth) then a simple batch solar water heater can be installed. This consists of a tank that is placed on the roof and which can either be integrated with the collector, or supported to be higher than the collector and separate from it. This tank is called a thermosyphon tank as the heated water rises into the tank. These systems store the heated water directly into the storage tank on the roof that may cool down overnight. The tanks are usually painted black and not insulated. In some advanced developing countries with high insolation levels SWH makes even more sense and mainly direct systems are used as there is no risk of freezing. They are fitted to the roofs of buildings as described above. However, due to up front cost not all the potential is realised. In addition where an active or pumped solar thermal system is used a Solar PV panel can be fitted which activates when there is enough solar energy to heat the water in the collector. SWH can be applied in developing countries, although there are requirements for a reasonable building envelope especially for roof space. This may imply that very poor households may not immediately benefit although very simple technologiesy in the form of a simple hot water tank is also possible. Recently, two studies reported by REEEP in the Caribbean and Brazil highlighted the potential for this technology through new ‘fee for service’ financing systems (Guiney et al, 2006, and Rodrigues et al, 2006). The markets in China, Australia, New Zealand and Europe are the fastest growing with a 25% growth rate in China and Taiwan followed by 19% in Australia and New Zealand then 13% in Europe. Swimming pool applications also recorded an increase. With a view to the application of the technology in Russia, where presently no market development is taking place, a meeting was organised by EREC and the Russian Energy Technology Centre in May 2007 on ‘Perspectives for solar thermal energy in Southern Russia’. new applications such as desalination. A solar air conditioner using an indirect-direct evaporative cooler has been developed in the USA with savings of 92-95% in energy use. Another development is the use of high temperature heat where solar radiation is concentrated with temperatures up to 400ºC claimed using solar roof technology. For the range of 80-250ºC for industrial processes, a range of technologies are available, some of which involve the concentrating technology such as CFC collectors. Weiss and Rommel (2005) have reviewed available technologies and conclude that industrial applications are feasible and that anti-reflective coatings on solar glass would improve efficiency on all solar thermal devices. The potential of SWH in the EU to replace conventional energy sources is large; the technical potential in the EU is 300 million m2 of collectors (equivalent to 210 GWth). If 30% of this potential was achieved, then it has been estimated that this would reduce EU CO2 emissions by 6% of the Kyoto commitment. Thus, at present the EU uptake is in the region of only 5% of the possible uptake. For China the Solar Wind Energy Resource Assessment is in the process of producing wind and solar assessments for China in the form of a high (10-km) resolution solar map in cooperation with German Aerospace Center (DLR) and a medium (40-km) solar map in cooperation with US National Renewable Energy Laboratory (NREL). A geospatial toolkit will integrate solar and wind data with GIS data to support an overall solar and wind energy resource assessment. In Kenya a similar study is taking place under SWERA. The Ministry of Energy and the University of Nairobi are cooperating with the DLR, the Risø National Laboratory and the NREL in the production of wind and solar assessments for Kenya. Other countries in the SWERA programme are Ethiopia, Ghana, Bangladesh Nepal , Sri Lanka, Brazil, Cuba, El Salvador, Guatemala, Honduras and Nicaragua. New systems for thermal storage are also being explored and the use of heat exchangers. Essentially, most of the equipment is standard but its performance can be improved by new developments, which, however, would also require additional technology. Water is generally used as the thermal storage medium, but new adsorption processes are also used which utilise zeolites for long-term trans-seasonal storage. Other thermal storage options are being developed. For most applications SWH is regarded as a mature technology but new combinations and applications are being developed all the time. Solar cooling and combi systems are still not standardised. In the EU, especially within the framework of IEA, there is continuous assessment and development of the technology. According to Weiss et all. (2006), in 2004, Europe had 10.8 GWth (equivalent to 15.4 million m2 mainly flat plate and evacuated tube collectors, where the conversion factor for collector area to solar thermal capacity is 0.7 kWth/m2). The technical potential in the EU is 300 million m2 of collectors (equivalent to 210 GWth). It has been estimated that if 30% of this potential was achieved, then this would reduce EU CO2 emissions by 6% of its Kyoto Protocol commitment (reducing CO2-eq emissions by 8% below 1990 levels). Thus, at present the EU uptake is in the region of only 5% of the possible uptake. According to ESTIF (2006), up to 1.4 billion m2 could be realised in the EU-15 providing 680 TWh of heat energy by 2040. This equates to 6% of current final energy consumption. Therefore, the size of the market for the future is estimated as 4 to 5 times the current potential. Current penetration represents a small fraction of this potential market. By 2015 it is estimated that with current incentives 46 million m2 would be installed which could rise to 200 million m2 if political conditions are put in place to speed up uptake. The EU is calling for 100 million m2 by 2010 which would require an uptake rate in the EU equivalent to the current rate in Austria. If all EU countries enacted appropriate building regulations now, the collector area in 2015 in the residential sector alone would be 199 million m2. Thus the economic potential in the EU alone is very large. In the EU-15 alone the potential usage of solar thermal amounts to 58 MToe per annum which is equivalent to 30% of oil imports from the Middle East. The social acceptability of the technology is high with no problems reported as it is a benign technology on the roof of buildings. According to ESTIF (2006), if the required political and market conditions were put in place, 580 000 full time jobs would be created by 2030 related to producing, operating and maintaining SWH systems. These would be local jobs in manufacturing, engineering, installation and maintenance. Relative to coal-based and nuclear energy, the number of jobs per 1000 GWh of supplied energy is 90 for hard coal ,72 for nuclear energy, and 3960 for solar thermal. As with all technologies there is a need for training and quality control programmes as well as information provision and preferably some form of policy to promote and require the technology installation. Suppliers also need to be fostered along the supply chain, though the basic hardware for SWH is simple and commonly available. The solar collector, however, needs a specialist manufacturer. The technology does not have a HI-tech image. Positive examples and demo projects especially in the public sector. In the UK, training programmes for installers have been created through government interventions on specific programmes such as ‘Clear Skies’. From 1 April 2006 a new programme (duration 3 years), the Low Carbon Buildings Programme, has taken an integrated approach combining energy efficiency measures at the domestic, business and public sector levels with small-scale renewable energy or low-carbon energy supply devices. Lists of installers and suppliers are provided and grants are available to encourage uptake of the technologies including SWH. Although in Europe government subsidies are common, as for example in the UK, other studies have shown that stimulating the technology in collaboration with Energy Service Companies (ESCOs) is feasible and commercially viable (Guiney et al, 2006; Rodrigues et al, 2006). For developing countries, the SWH technology has great potential to limiting the import of fossil fuels and would lead to economic growth and jobs through adoption of the technology at a local level. It is not very complex and local supply chains could be set up. It would still need some form of incentive for adoption but there are models to make the technology economically viable as shown in the recent REEEP funded studies in Brazil and the Caribbean. Regulations such as that in Barcelona and Israel requiring the technology would make its adoption easier. China has great experience with solare thermal and is one of the largest players in the use of the technology and the potential penetration of the SWH is very high. In terms of economic and social benefits, the technology can contribute to sustainability especially as it is relatively simple and could be delivered by locally trained installers with local supply chains in the main. This would lead to jobs and to a better quality of life, as well as minimise energy bills and dependency on fossil fuel imports with their corresponding vulnerability to price fluctuations. It is a safe technology avoiding fire and other health risks. It is particularly applicable to developing countries for space cooling and hot water. In central and northern Europe, depending on the configuration and building characteristics, 10-60% of the combined water and space heating requirements can be met by solar thermal technology (Philibert, 2005). The annual solar thermal production depends on the solar radiation available, the outside temperature and the technology used and can range from 1000 kWth/m2 in Israel to 350 kWth/m2 in Germany. Currently, solar thermal already provides more than 40,000 full-time jobs in Europe (approximately 1 full-time job per 80 kWth of newly installed capacity). European manufacturers have a clear technological lead when it comes to solar thermal (ESTIF 2009). 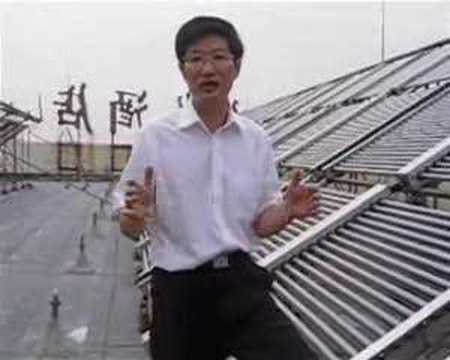 China is the major developing country using solar thermal, as discussed above, and represents one-third of the installed capacity worldwide. Brazil is next with 1.59 GWth capacity. Other countries, such as Barbados, Mexico and South Africa have much lower capacities installed. Although the potential for use of the technology in developing countries is very high, only few countries have any existing installed capacity. This is an obvious area for expansion for use to supply needs and minimise import of fuels. Low-temperature water heating is an important contributor to lowering energy demand for heat in the residential, public and industrial sectors. 41 countries currently use solar thermal technology with an estimated installed capacity in 2005 of 115 GWth and an annual collector yield of 58,117GWh (209,220 TJ) (Weiss et al, 2006). In the USA and Canada the technology is mainly used for swimming pool heating using unglazed plastic collectors (in the USA the solar heating capacity for this service amounts to 18.4 GWth) while the other countries use flat plate and evacuated tube collectors for hot water and space heating. The leading countries for solar-based water and space heating are China (43.4 GWth), Japan (5.4 GWth), Turkey (5.1 GWth), Germany (4.53 GWth) and Greece (2.1 GWth) in terms of capacity. Also in other countries it is considered a major end use for energy, e.g., in Brazil the residential sector alone accounts for 24TWh/y installed capacity. The use of solar thermal as indicated above could have a major impact on the need for imported supplies of fuel so that security of energy supply would be improved. Most of these technologies lead to savings though some developments still need to be made commercially competitive. Maintenance costs are very low. In addition, many countries have a programme of subsidies to develop demand and are improving training and quality assurance of suppliers. Solar thermal is not a complex technology for space heating and cooling and hot water provision and it has been available for many years, though it is improving all the time. Systems have been shown to work for decades. In terms of other benefits for the environment the technology avoids the use of fossil fuels and their emissions, while being a silent technology. According to Weiss et al. (2006), the contribution of solar thermal systems to energy supply of 58,117 GWh mentioned above corresponds to a total annual avoidance of 25.4 Mt CO2. The use of the technology does not produce GHGs, although life cycle implications (construction of different parts) are unknown. For calculation of these GHG emission reductions, it is recommended to apply the approved methodologies for consolidated methodology for grid-connected electricity generation from renewable sources project (small scale activities) which has been developed under the Clean Development Mechanism of the UNFCCC Kyoto Protocol (CDM). This methodology helps to determine a baseline for GHG emissions in the absence of the project (i.e. business-as-usual circumstances), how emission reductions below this baseline can be calculated, and how these reductions can be monitored. General information about how to apply CDM methodologies for GHG accounting can be found at: http://cdm.unfccc.int/methodologies/PAmethodologies/approved.html. According to Philibert (2005), costs of SWH systems can vary greatly from country to country. In Greece a domestic solar thermal hot water system for a one-family unit (2.4 m2 collector area and 150 litre tank) costs € 700, but in Germany with a 4-6 m2 area and 300 liter tank it costs € 4,500. Conversely, a system for space heating will provide greater savings in the north than the south. In northern France, savings of €730-900 per year are quoted compared to € 120-180 in the southern part of the country. Capital costs of solar air conditioning systems tend to be several times that of conventional systems. However, cost figures per unit of energy improve if a combined heating and cooling system is used. In general, for solar thermal systems, depending on the system, the application, and locality, there is a wide range of cost efficiency from savings schemes to systems where economies of scale are still required for some systems though not the existing standard systems. In the EU, the subsidies currently given to coal-based and nuclear energy amount to more than € 28 billion/year without including external costs. Funding at that level together with the energy savings would enable renewables to replace fossil fuel-based and nuclear energy without additional burdens on the economy (ESTIF, 2006). The EU calls for 100 million m2 of solar thermal surface by 2010 helps to stimulate interest and the market but subnational programmes are available. For example, the German Solarthermie 2000 plus aims to increase the annual solar contribution to hot water and heat production from individual installations from 10-30% to 60%. Seasonal storage is targeted with grants of up to 50%. The new certification and quality standard the Solar Keymark is now being introduced to harmonise standards across the EU which will encourage growth through reliability. The IEA as been a prime mover in this area since 1977. It has a Solar Heating and Cooling programme responsible for a series of R&D and policy tasks for the implementation of the technology, such as the solar resource knowledge management task which complements the UNEP Solar Wind Energy Resource Assessment (SWERA). Another area is solar assisted cooling systems to improve conditions for market introduction for small and large-scale applications, as demonstrated by the IEA. EU Intelligent Energy programme under the sub-programmes of SAVE, ALTENER and COOPENER have funded projects on solar thermal. The EU Altener project Soltherm, which aimed at achieving a situation with a solar water heater for every European, has ended, but has initiated a European network of experienced and new market players and has created new marketing campaigns to boost the solar thermal market. It has also provided a forum for exchanging experience and improved ongoing activities in the market through insights gained. At the end of May 2006, the European Solar Thermal Technology Platform (ESTTP) was launched by the European Solar Thermal Industry Federation and the European Solar Energy Research Centres Agency (EUREC). It aims to develop a comprehensive strategy for research and market deployment of solar thermal technologies in Europe by providing a platform for the exchange of expertise and knowledge. Worldwide, there are many programmes run by organisations such as the USH2O, REEEP, UNFCCC/TTCLEAR and ADB Finesse project programmes. Two recent studies funded by REEEP are directly relevant here and address one of the main issues for new and clean energy sources; the high up front costs of some systems. A study in Brazil funded by REEEP under their programme on innovative financing to accelerate solar water heating (Rodrigues et al., 2006) explored the economic feasibility of setting up an ESCO to supply solar water heating and heat pump services in Brazil focussing on the Sao Paolo area. The ESCO owns, installs and services the solar water heater. The services were targeted on apartment buildings, hotels and swimming pools. Although there were problems in gathering information, comparisons with existing sources of water heating such as LPG, natural gas and electricity for pools showed that an ESCO was viable with a good internal rate of return on investment (30%). A business plan was developed and the optimal size for a company explored along with its possible administrative and management structure. Possible candidates to progress the opportunity were also identified. Another Innovative financing project funded by REEEP (Guiney et al, 2006) for businesses to sell SWH involves a fee for service for Caribbean utilities in a similar model where the utility would own, install and service the SWH. The sectors targeted were residential, industrial and commercial sectors. As in Brazil, electricity is currently used for water heating. The report provides a guide for utilities to design and implement a fee for service SHW programme. Alternative models to the ESCO approach where metering is required is a lease or rental approach where the utility still owns the equipment. Another option to avoid metering is to charge a ‘flat fee’ per month. Financing institutions are identified such as the IFC and development banks. Other ‘fee for service’ examples include Lakeland Electric in Florida, USA, and NewEnergies in South Africa. Renewable Energy Certificate trading is also seen as a viable way forward and a way of bringing these technologies into the green power market. The Renewable Energy Financing in the Mediterranean Region Project (MedREP) initiated in 2002 by UNEP with the support of the Italian Ministry of Environment and Territory is designed to increase investment in the renewable energy sector in the southern Mediterranean initially in Tunisia, Morocco, and Egypt. The MedREP study will investigate options for increasing finance flows to renewable energy companies and projects in target countries as well as develop support mechanisms for lenders and investors to finance larger scale commercialisation. Possible mechanisms include seed or patient capital funds, interest rate subsidies, and investment advisory support facilities. The Rural Energy Enterprise Development (REED) initiative operated by UNEP has several programmes. AREED (African REED) is one example with the aim of developing new sustainable energy enterprises. It offers rural energy enterprises in Mali, Ghana, Tanzania, Senegal and Zambia enterprise development services and start-up funding. UNEP DTIE offers finance for interest rate subsidies and investment advisory support facilities. BASE is a not for profit organisation which in collaboration with UNEP ‘helps to build strategic partnerships between entrepreneurs and financiers to mobilize capital for sustainable energy in both developing and industrialized countries’. As of 1 February 2010, there are 10 solar thermal projects in the CDM pipeline - 5 are registered and 5 are at the validation stage. European Solar Thermal Industry (ESTIF), 2003. Sun in Action II - a Solar Thermal Strategy for Europe. European Solar Thermal Industry (ESTIF), 2006. Solar Thermal Markets in Europe. European Solar Thermal Industry (ESTIF), 2009. Solar Thermal Markets in Europe – Trends and Market Statistics 2008. Mangold, D. and Schmidt, T., 2006. New steps in seasonal thermal energy storage in Germany. Pereira, M.P.I.C. and Almeida, de J.M.P., 2006. New CPC type solar cookers to be integrated into kitchen wall, Eurosun 2006. Weiss, W. and Rommel, M., 2005. Medium temperature collectors: State of the art, within Task 33/IV. Weiss, W., Bergmann, I. and Faninger, G., 2006. Solar heat Worldwide - Markets and contribution to the Energy Supply 2004, Report for International Energy Agency Solar Heating and Cooling programme. Submitted by Robert S Dolan (not verified) on Thu, 02/10/2011 - 16:08. I'm contacting you in hopes that you could help me find homes for our over 220 used solar thermal collectors. Submitted by lauraw on Fri, 02/25/2011 - 19:22.
maybe it's worth moving this question of the forum of the website. Unfortunately the editor team of ClimateTechWiki is probably not able to help you with this request.